I am back today with another #MichaelsMakers challenge. 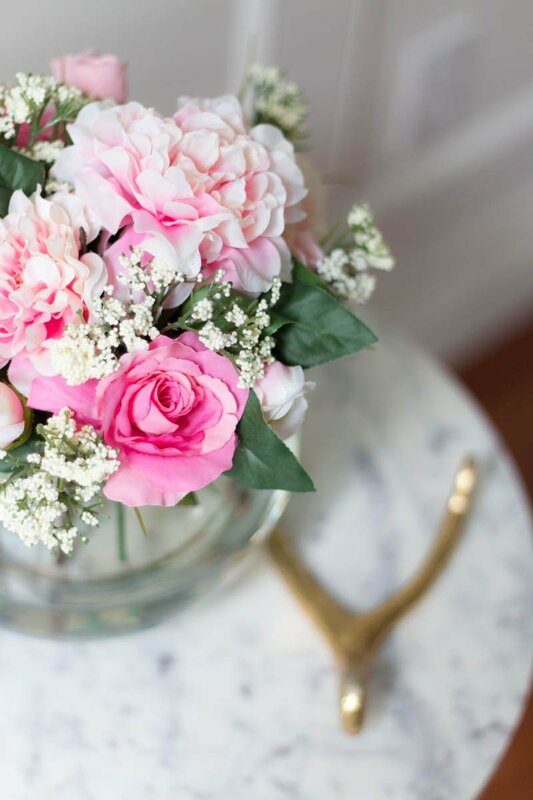 This month we were asked to include stems from the Michaels’ Floral Market. I was blown away with how many new stems they have and how real so many of them appear. 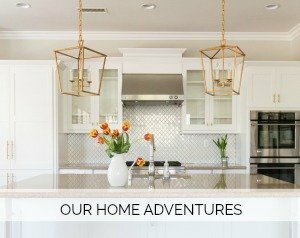 I decided to show you a couple of easy ways to add a touch of Spring to your home. 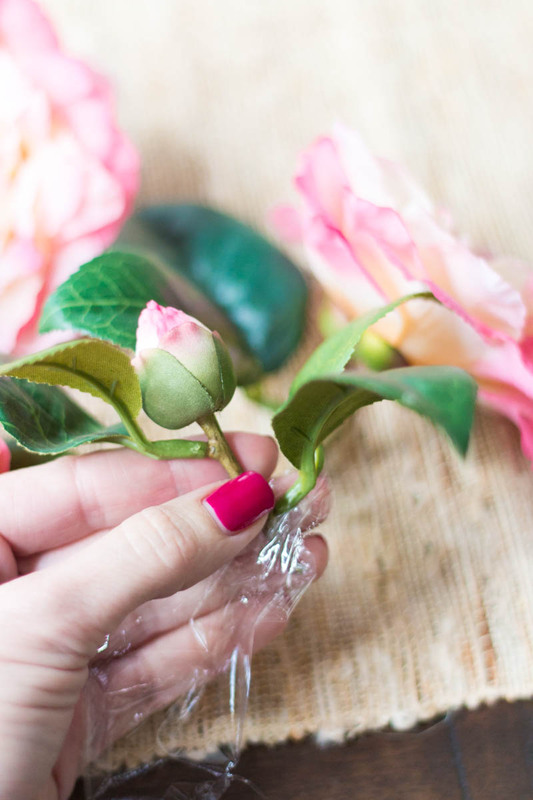 Here are two simple DIY faux floral hacks. 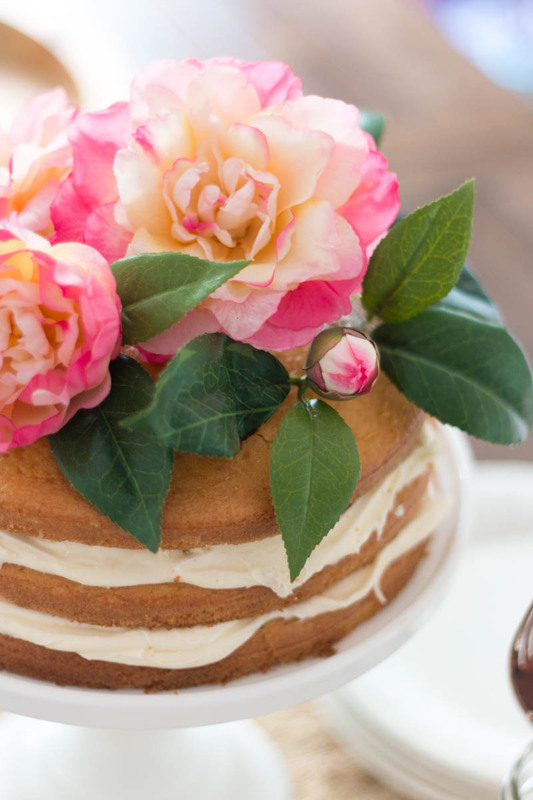 First up is a naked cake topped with pretty flowers. I have done this in the past with real stems but I love the idea of having these on hand and now I can reuse them. 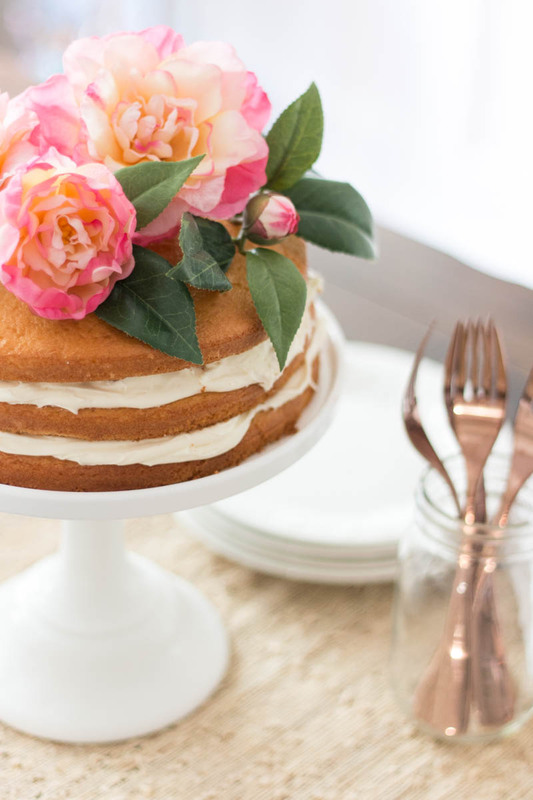 For us non-bakers in the crowd, there is no better way to make a cake look fantastic. 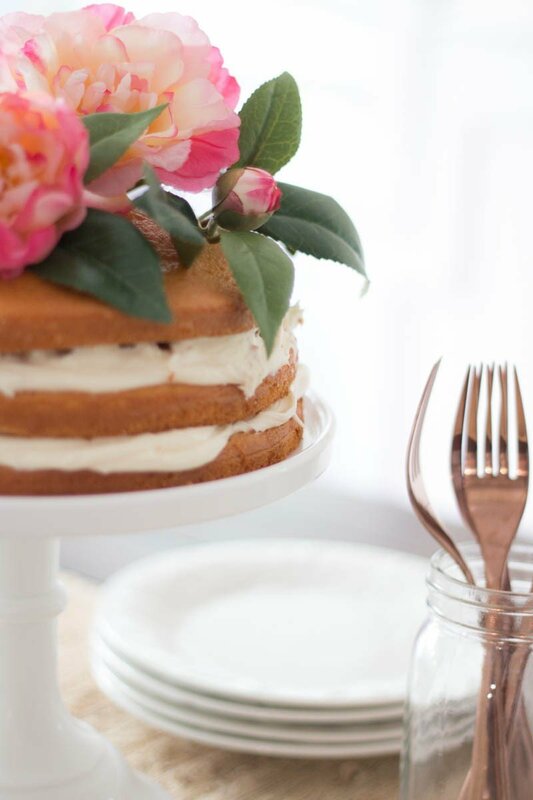 A box cake layered with icing in between suddenly looks beautiful once you place some pretty flowers on top. I cut each flower way from the main stem leaving just about 1/2 ” of stem. That is enough to gently place in the cake. I also wrapped the end of each stem with a little bit of plastic wrap. Just made me feel better about putting it in the cake. 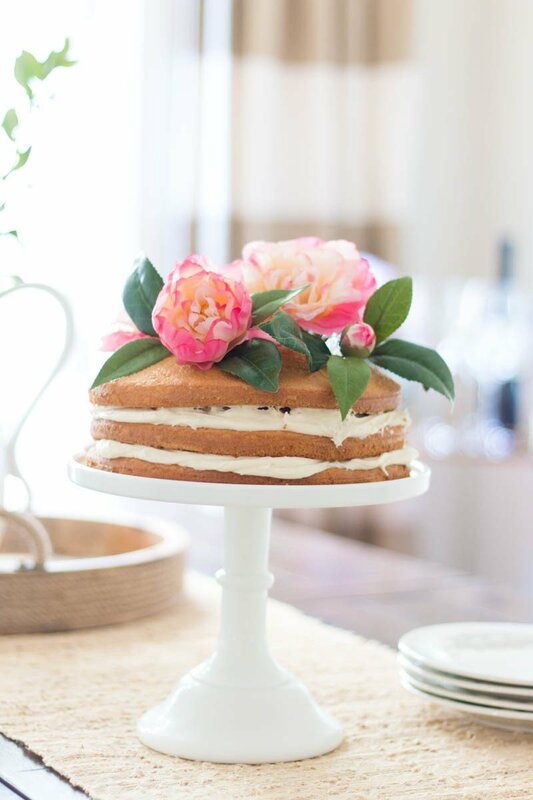 I also really like this idea because there are times when I entertain and want to get things done ahead of time I can have the cake made and covered and pop the flowers on without having to wait until the last minute. I also appreciate that sometimes I can’t find the exact flower I want at the time of my parties so this is a nice work around and allows me to get just the look I want. I think incorporating full sized blooms with the bud makes it look more real. These were all cut from just one faux stem. Next up I thought it would be fun to show you how I created a $25 arrangement after seeing an inspiration arrangement for $275 (crazy talk). I almost fell out of my chair when I saw the pricetag. Like, what?! I had never created a faux arrangement so I thought it was time to try. I think my version turned out pretty well. While I am always a fan of fresh flowers in the house, there are times when I really do appreciate having a pop of color that won’t wilt on me. I made this one to keep back by our DIY butler’s pantry. When I have fresh flowers I will use those. When I don’t, I can keep this out on the counter. It’s a spot we all see when we walk in our back door so it’s always nice to have a dose of color. Another spot I often use faux stems are on our patio. If we are entertaining I will use real, but on day to day basis I like to look out and see pretty flowers on the table. Rather than stop and take a photo of how to DIY this arrangement, I thought it would be easier to do a quick video. It may be a little rough around the edges but it gives you a step by step for creating this flower bowl. Faux Floral Arrangement from A Thoughtful Place Blog on VimeoThe only other tip I would suggest is making sure no leaves fall into the water. First and foremost because they can turn the water green. But it also just looks prettier to only see the stems. Some people use foam (which you would have to cover) or tape to create a criss cross pattern across the top of the vase. That would create a grid for you to fill. You can also use a product called Quick Water to create fake solid water. I didn’t like the idea of this being permanent. That just screams dust to me so the way I made it allows me to dismantle and recreate it whenever I choose. 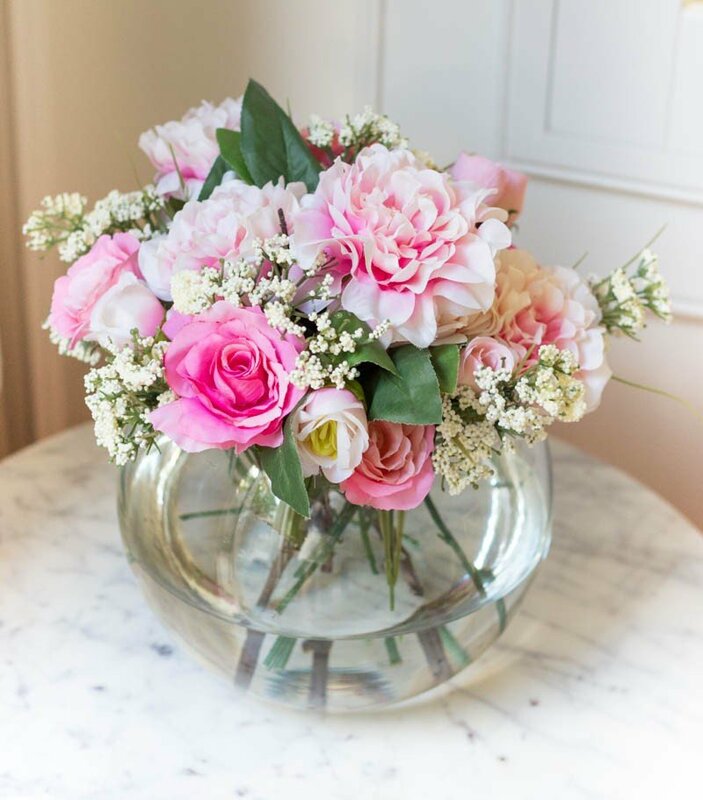 And if you are a blogger or someone who does a lot of photo shoots, it really is nice to have a couple of faux arrangements that can be used in photos. Even if they are just in the background. It makes it nice to have that added splash of color and this one won’t break the bank. The good news is that all faux stems are 50% off right now! Be sure to pop in tomorrow because I have a really exiting opportunity for anyone who likes to be creative! Feel free to take a look at some of the projects on Michaels.com or the other 49 Makers’ ideas on The Glue String to see how they personalized their floral crafts! You can also check them out below. Gorgeous and the video is great also. I never think to add water to my faux’s. Super suggestion. Thank you so much, Marty. At least we held the camera the right way for this video. Last time we didn’t. Live and learn, right?! Hope you are having a great week. Always love hearing from you. I loved your video. You are a natural Cortney! Fun to hear your voice, too. Your arrangement is beautiful and those faux stems look so real. Adding water is a great tip. Thanks, Allison. Nothing worse than hearing your own voice. Ha! So thanks for the vote of confidence. Don’t they look pretty darn real?! I was shocked with the stems they came out with this year. Hope you’re having a lovely Tuesday, my friend. That’s so funny–I was just in Michael’s last week and couldn’t get over how pretty their fake flowers were. 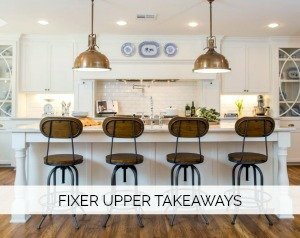 I, too, prefer fresh, but it would be nice to have some on hand for small projects like this. And, I’m totally making a naked cake like this for Easter–such an easy idea and oh so lovely! Gorgeous arrangements. 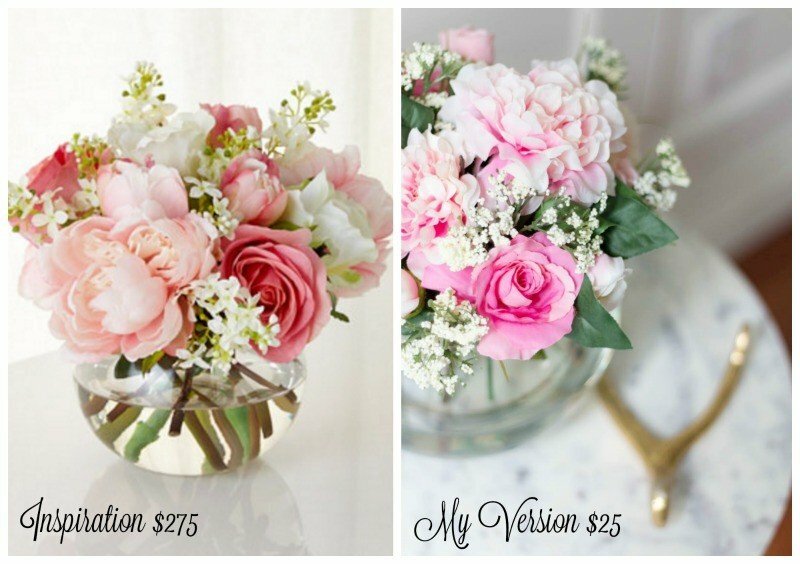 The world of faux flowers has really come a long way. I use them all over my house and then just mix in real flowers in the kitchen. 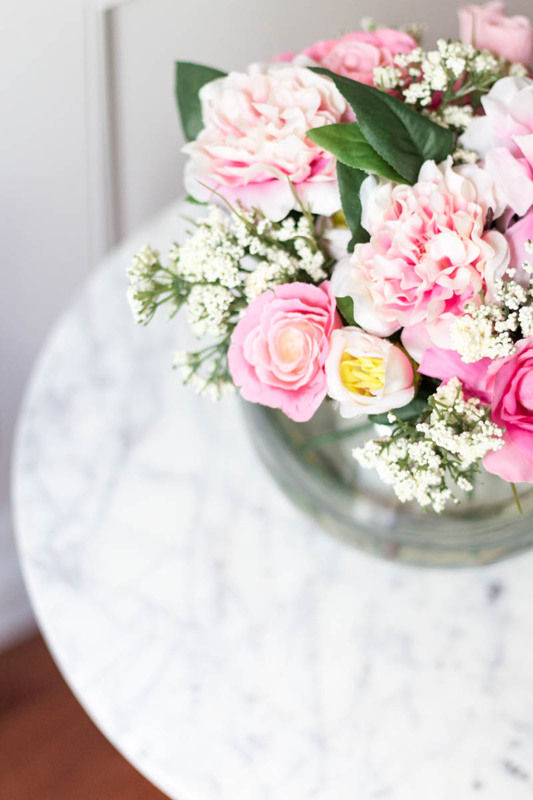 It really brightens up the house and makes it feel fresh and feminine.